This morning, Nielsen is putting hard numbers to how consumers like to shop with their smartphones, backing up trends we already suspected to be the case. In particular, the new report examines how consumers use their phones when shopping out there in the real world (what’s that?) – using phones to compare prices, scan barcodes and even redeem coupons. 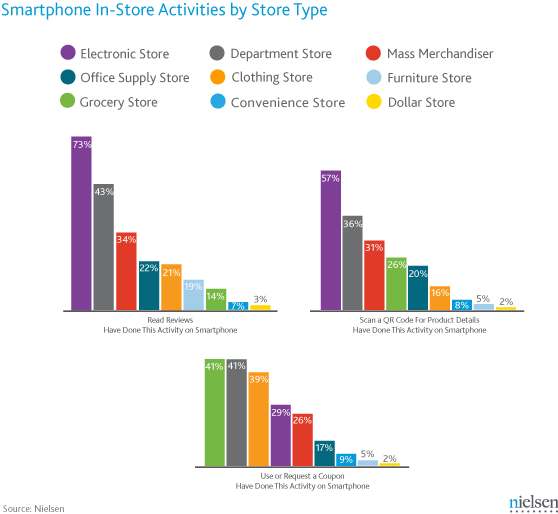 Not surprisingly, how you use your phone has a lot to do with where you’re shopping and what you’re shopping for, says Nielsen. The trends are sort of obvious, but there are some interesting bits to be pulled out of the data. For starters, mobile coupons are most popular at grocery stores, (41% of mobile shoppers said they used coupons there), department stores (41%), and clothing stores (39%). At electronics stores, the majority (73%) read reviews, compare prices (71%), and scan QR codes (57%). It seems the higher the purchase price, the more likely it is that users will whip out their phone to shop around. Or perhaps electronics buyers are just a bit more smartphone-savvy than the rest, happily scanning QR codes and the like? Something notable here, perhaps – assuming that, for many of these shoppers, price is the reason for the extra research, it initially seems somewhat odd that furniture shoppers don’t do the same. Only 19% read reviews, and a paltry 5% scan a QR code. And yet, their big-ticket purchases often cost more than a new HDTV. Why is that? Well, besides the fact that furniture is a more personal purchase, like clothing, it’s mainly because the exact same Ethan Allen sofa isn’t going to be found at a Ashley store for less. But it would be interesting if there were apps that could scan a furniture barcode or “see” a photo you snap then show you similar sofas at nearby stores or online as well as their prices. (Is someone building that? Because I’d use it today. I hate my sofa.) Unless you’re not in the income bracket where cost is not a concern, this seems to be an unfilled niche. One of the top reasons why people don’t buy furniture they fall in love with is because they feel the need to shop around. Back to the report. It’s not surprising to see minimal usage of the various smartphone technologies at fast-service or low-ticket item stores like convenience stores, dollar stores and office supplies stores, but it’s somewhat interesting to see moderate use at mass merchandisers (Walmart, Costo, etc.). Even though those stores appeal to users because of their low prices, it’s apparent that not all shoppers are convinced that they’re getting the best deal: 34% read reviews and 31% scan QR codes at these outlets. Given the right pricing on the right products, it seems department stores, electronics retailers and online shops can woo customers from the Walmart-sized chains, when it comes to higher priced goods. With brick-and-mortar stores turning into Amazon’s showroom, it’s more important than ever that merchants offer in-store shoppers some other advantage besides low prices. Expect the new crop of customer loyalty startups to have a big role in framing what that advantage might be.